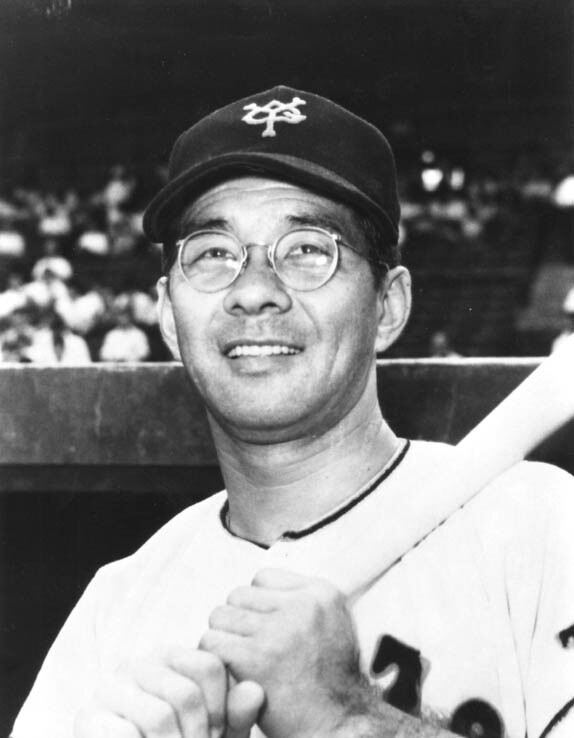 This morning, I read that the first American born man to play in Japan (Wally Yonamine, Central League MVP in 1957, born in Hawaii) was the first professional player to sprint from home to first on ground balls (before him, Japanese pros jogged or walked – could Manny Ramirez possess the soul of an ancient Japanese baseball player?) and the first to break up double plays by sliding hard into second base. That helps explain why no one is ever in a hurry here in Japan. 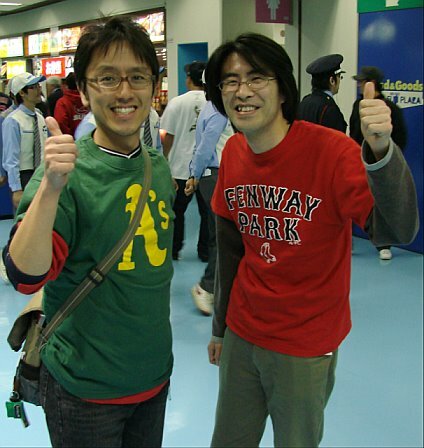 Before the second game of the Sox-A’s series, I had a chance to interview Japanese fans through an interpreter. Their answers to my questions were truly illuminating. First of all, three different people said, “Please take good care of Matsuzaka and Okajima” in response to my question, “Is there anything you want to tell the baseball fans back in the U.S.A?” Secondly, in response to my question, “What do you think of the U.S. fans who are here at Tokyo Dome?” all six of the fans I interviewed said, “We are grateful to the U.S. fans for coming here and showing their teams so much support.” Grateful is the key word. 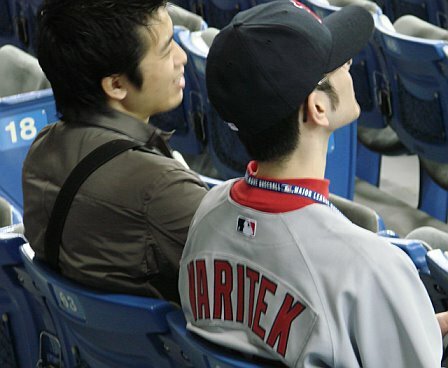 Several of the fans with whom I spoke said that their favorite Red Sox players were people other than Matsuzaka and Okajima (with Ramirez and Ortiz leading in popularity). 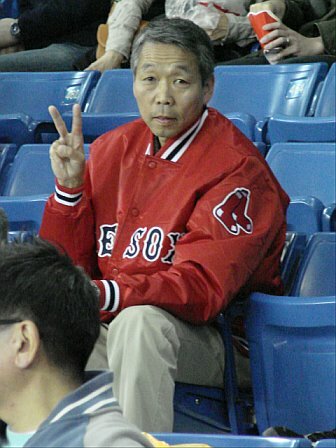 One fan who believes my powers as VP of RSN are supreme bent my ear for five minutes, expressing her frustration that “the Yankees and Mariners games are all televised in Japan because Matsui and Ichiro are everyday players, but Red Sox games are only televised when Matsuzaka pitches. Can you change that?” She also let me know that MLB-TV doesn’t work in Japan. “All of Japan is a blackout area,” she said indignantly. But I know that the more enduring memories of my trip to Tokyo will be about the people here and the stunningly advanced social culture of cooperation and respect for others. 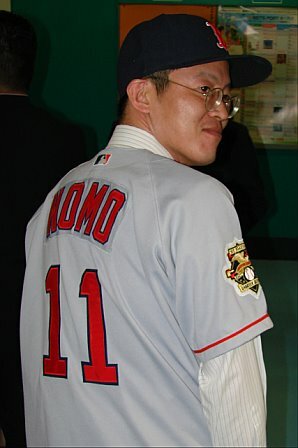 As one Japanese fan said to me in an interview, “We have learned a lot from American baseball players, but we think American players can learn a lot from how the Japanese play the game, as well.” This is absolutely true (the Japanese are obsessed with fundamentals and practicing), but in terms of what all Americans can learn from Japanese culture, the fan’s comment doesn’t go nearly far enough. What a way to start the season! I officially lost my voice when Brandon Moss hit that game-tying home run in the top of the ninth inning off of Oakland’s ace reliever, Huston Street. How about that — a rookie gets an unexpected start on Opening Day and makes it his best Major League game of his (short) career. Awesome. 1. 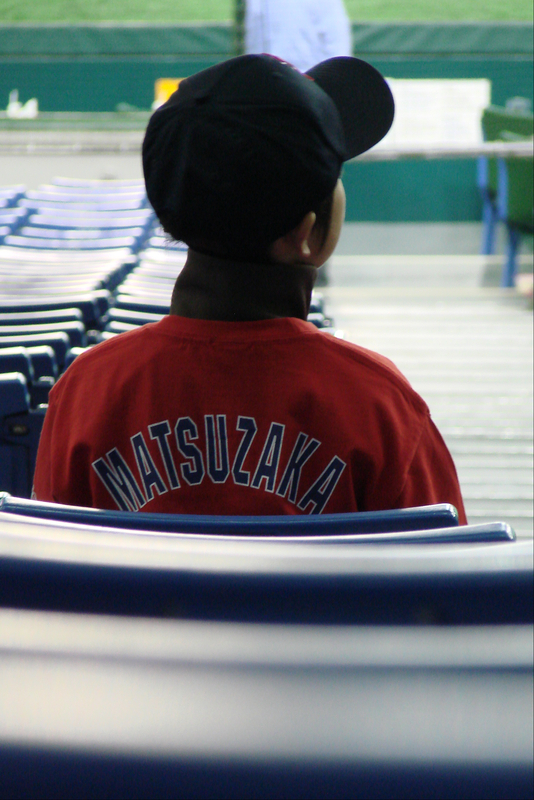 I was very surprised at the relatively modest applause that Matsuzaka received at the beginning of the game. (When I say “relative,” I mean relative to the kind of cheer that even someone like Dave Roberts or Doug Mirabelli would receive upon returning to Fenway Park.) I expected the noise and excitement level to be so high, Tokyo Dome’s roof would blow off. Not even close. The fans’ applause was certainly enthusiastic, but definitely not memorable. 2. Once again, I was sort of unnerved by the total silence between pitches in the first through third innings. Each pitch felt like (and sounded like) a serve at Wimbledon. All of us in the Red Sox Nation section half-expe cted an usher to kick us out when we cheered loudly for Youk, or Lowell, or whomever. But the place erupted when Okajima took the mound in the ninth, and the Dome stayed loud after that (by “loud,” I mean “Fenway loud”). 3. 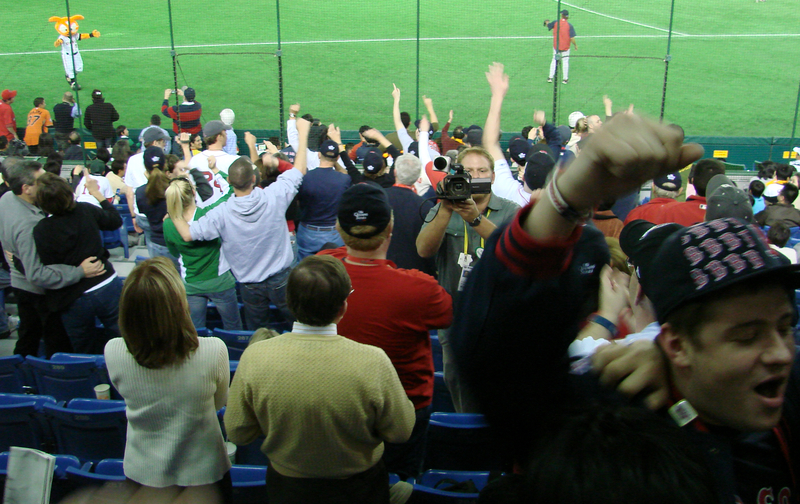 The Japanese fans at Tokyo Dome were eager to celebrate with the fans from the U.S. during and after the game. They came over in waves to give us high-fives. While spontaneous, it was a very welc oming gesture and an exhilarating cross-cultural experience for all inv olved. 6. And finally, if I were Hank Steinbrenner, I’d be very worried about falling way behind in the global competition for fans. He can call Red Sox Nation whatever he wants to call it, but it doesn’t change the facts. 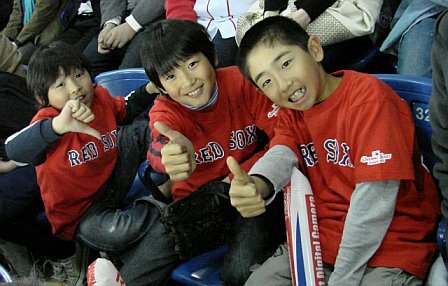 The Red Sox have become an irresistible international sports franchise whose popularity transcends the particular names on the roster, and little children around the globe are growing up chanting “Let’s Go Red Sox!” before they’ve even heard the word Yankees. 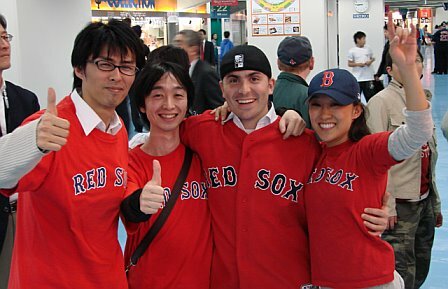 Certainly Japan, as these photos show, is squarely in the center of Red Sox Nation (although I did see one bold Yankees fan, who politely allowed me to photograph him for this blog… and there were some A’s fans too… so in the spirit of journalistic integrity, here they are). 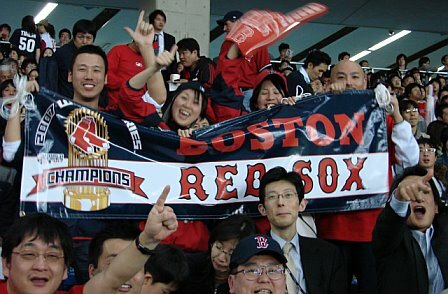 I was told that the Japanese are rigid about rules, so I shouldn’t have been surprised when I and about ten other Red Sox Nation members were barred from entering the Tokyo Dome with the rest of our group. Why were we not allowed to join our party to see the Red Sox’ afternoon workout? 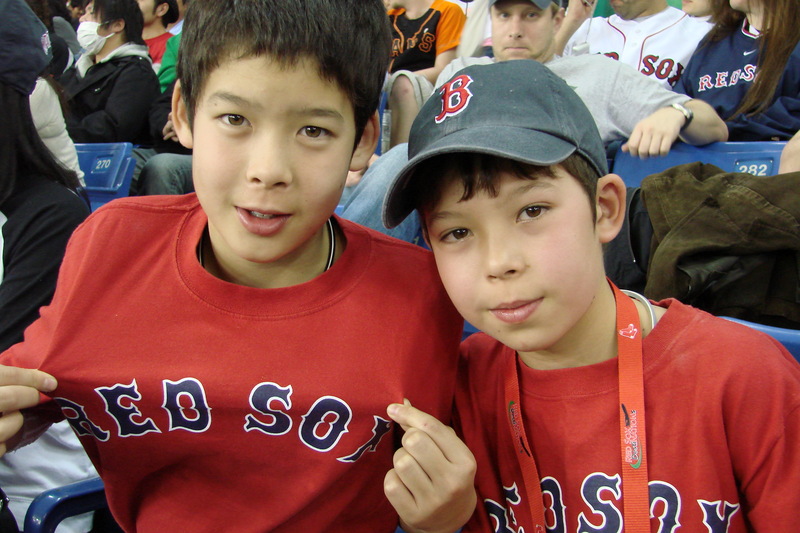 Because, you see, we were not wearing our Red Sox Nation badges around our necks. (We had left them at the hotel.) No badge, no entry, period. Our tour guides explained in Japanese that we were legitimate members of the Red Sox group, but the security guards seemed genuinely puzzled — as though no one had ever, in the history of the Tokyo Dome, attempted to talk his way into the park. And yet, while refusing us admission, the security guards could not have been more polite and considerate. Still, rules are rules in Tokyo. No badge, no entry. Period. Now eventually, they did let us in, and the solution to the problem tells you more about Japanese culture than anything else I’ll write while I’m here. Several Japanese people working outside the dome with badges found out what was going on and handed us their security badges to borrow for two hours. 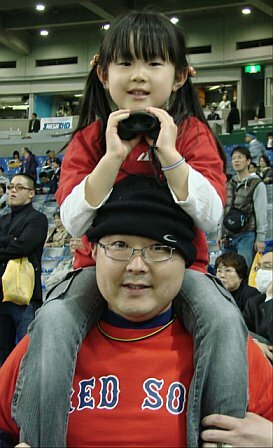 As soon as I had Tomoko Hiragi’s badge around my neck, I was whisked into the Dome as if I were the President of Red Sox Nation. Amazing, no? I nside the dome, 150 of us crowded into the front two rows along the first base line and into deep right field to watch a baseball practice. Other than the fact that J.D. Drew entertained us with multiple bombs into the right field seats, there really isn’t much to report about the practice itself. They played catch. They fielded ground balls. They jogged a lot. They took B.P. Hey, it was their last practice before a grueling 162-game schedule, and they were just trying to stay loose. But you know what I’ll remember about today’s practice? Billy Torres, a seventh grader from Swampscott. 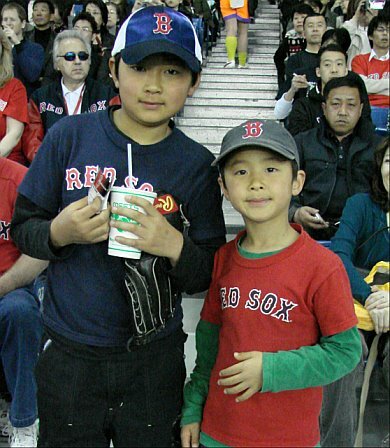 Billy’s dad, Bill, won an all-expenses paid trip for two to this opening series in a random drawing on WEEI and decided to bring his son with him. Today, Billy had a fan experience that will be difficult to top during his lifetime. Standing in the first row in right field’s foul territory with a glove on his hand, Billy was intent on getting a ball. Somehow. 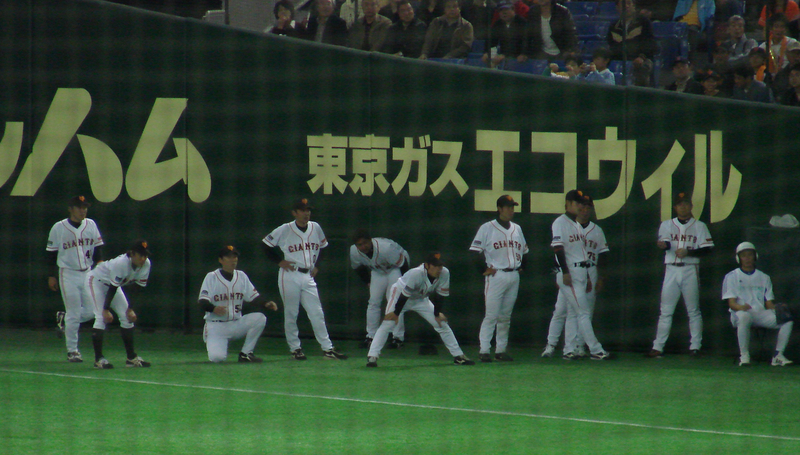 But the players were pretty much ignoring us, the security guards on the field (following a Tokyo Dome rule, no doubt) would not even pick up foul balls at their feet, and we were too far foul for any batting practice shots to reach us. So Billy took matters into his own hands and set out for the right field bleachers. 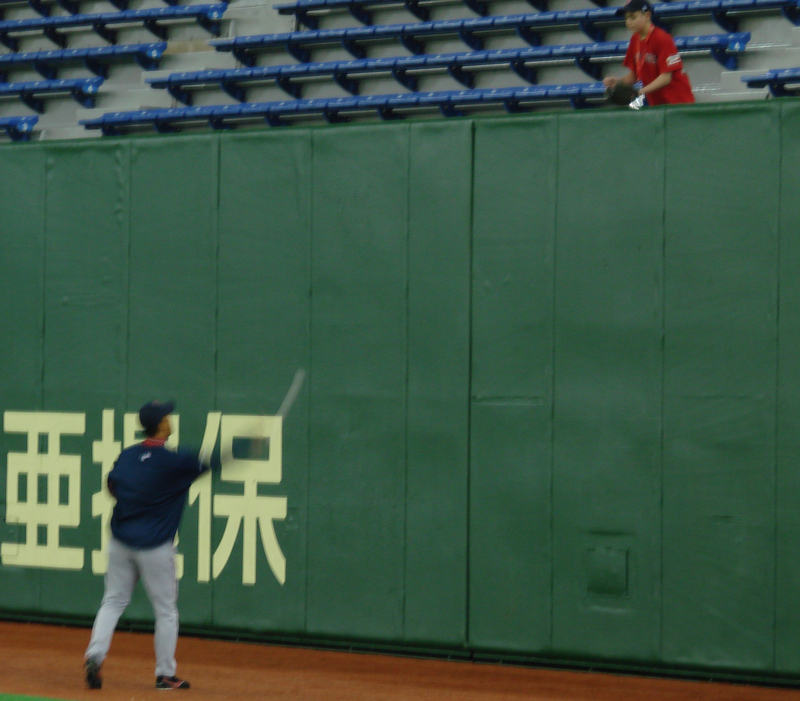 Good thing he didn’t know that fans aren’t allowed up there, or else he wouldn’t have grabbed a Manny Ramirez home run ball, then asked Daisuke Matsuzaka and Hideki Okajima in Japanese to sign his ball (a local TV reporter taught him the words). Both stars, who were standing on the warning track chatting during B.P., happily obliged for the only kid near enough to them to get their attention. Billy threw them his ball and a pen, they signed, then they tossed them back. Seconds later, a polite security guard asked Billy to leave the bleachers and return to the group. No time for sleep! 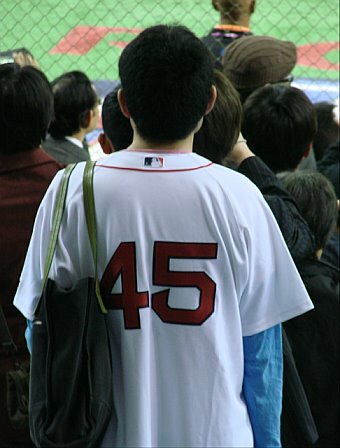 Even though our bodies were craving some shut-eye, the Red Sox Nation crazies from the U.S. who are here in Japan boarded a bus at 5:30pm Sunday night (that’s 4:30am on Easter Sunday back home) to go see a ballgame. On the bus, I sat next to Deanne from Melrose, an E.R. 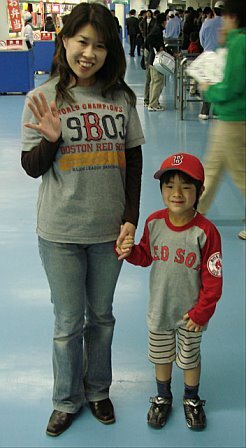 nurse at a hospital just outside of Boston and a single mom, who said she made a “spur of the moment decision to take a vacation and come to Opening Day in Japan.” Before we could have a real conversation, though, the bus was invaded by a TV crew from Tokyo’s TBS network and a bubbly young Japanese reporter wearing Red Sox gear and a lot of make-up. She asked us questions about our fanhood in broken English and before long we were chanting “Let’s Go Red Sox!” and yelling “Red Sox are number one!” in Japanese (she taught us these words). She even got us to sing a verse of “Sweet Caroline,” a song that she said is also very popular in Japan. To my left was Dalton Maine, whose plane from Chicago had gotten him to Tokyo just in time for this game. Before settling in Chicago, he grew up in Framingham and played minor league baseball in the Orioles’ organization. 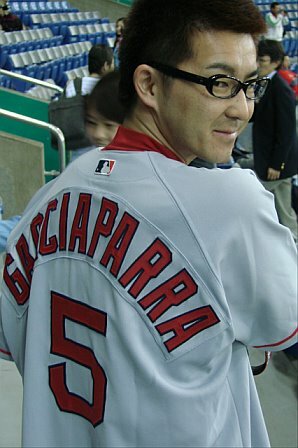 (With some probing, I learned he struck out Vladimir Guerrero, Miguel Tejada, and Frank Thomas at different times in his pro career.) Dalton was there with his mom, Billie Maine, who recalled taking Dalton to his first game at Fenway when he was a little boy. “A player threw him a ball, and then he expected to get a ball at every game after that.” The player, Dalton informed me, was Royals pitcher Dennis Leonard. 2. 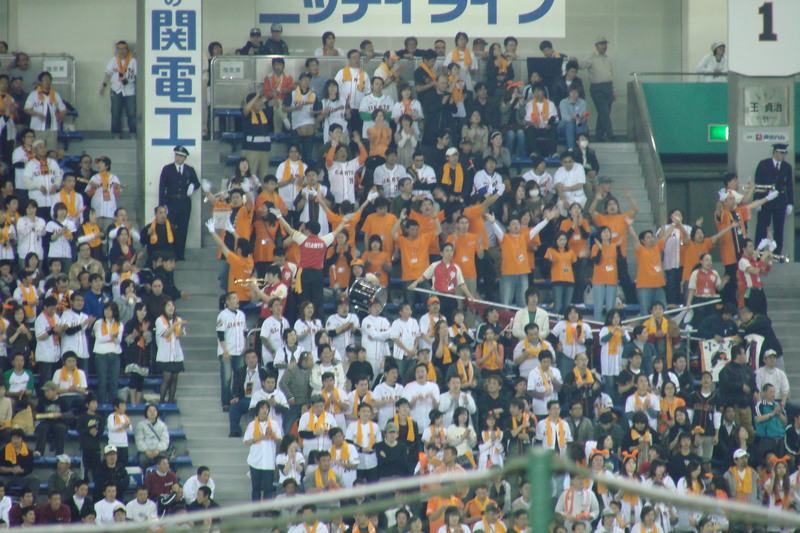 I heard that Japanese fans are rabid and crazy, but here’s what I saw: there are about 200 fans (many wearing orange, others wearing yellow scarves, all banging drums) in the right field seats who sing and chant constantly, reminding me very much of the college football fans of Clemson University, and the rest of the stadium is virtually silent during most of the game. I am not exaggerating when I tell you that it’s as quiet as the first tee at the Masters prior to every pitch (unless the cheerleaders in right field haven’t finished their song yet). 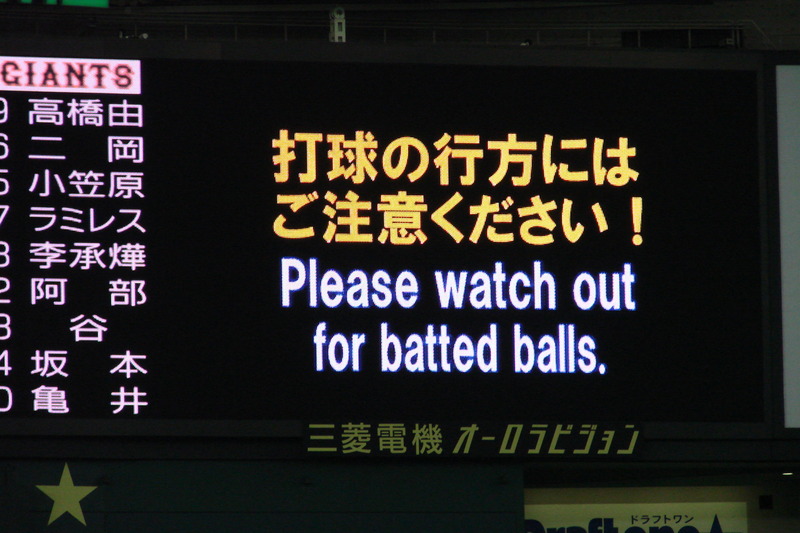 It’s not that fans are not allowed to make noise, but whereas there’s positive pressure at Fenway to yell, “Come on, Papi!”, at the Tokyo Dome, you’d be the only one doing so. (And when I did, I’m sure Papi could hear me loud and clear from 150 feet away.) And the fans never stand up, except when there’s a home run (thank you, J.D. Drew and Jed Lowrie). 3. The stadium is ultra-clean. When I told Dalton I imagined we could eat our dinner off the floor, he said, “Are you kidding? I’d rather have surgery on this floor than in a Chicago E.R.” I went to the bathroom for the first time in the 7th inning, and it had obviously just been cleaned minutes before. Either that, or no one else had used it before the 7th inning, either. 4. The hot dogs they sell in the stands are all individually wrapped in elegant cellophane envelopes. Quite a contrast to the (delicious) Fenway Franks that are removed from the mysterious, oily water and placed in buns before our very eyes back home. 5. 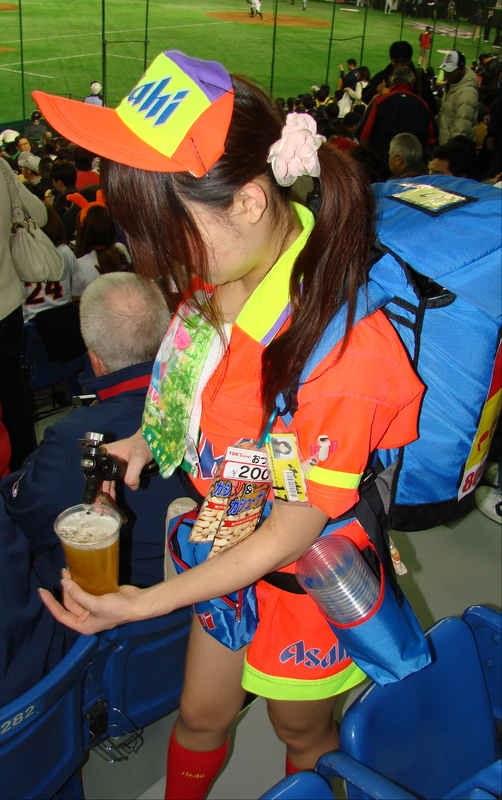 Beer is sold in the stands by girls wearing short skirts who appear to be between the ages of 15 and 21, and they carry very heavy canvas kegs on their backs, fill a cup, and hand it to you. A Japanese native explained to me that, to become a beer vendor, you have to pass a vigorous physical test. (Oh, and they also sell little bottles of hard alcohol.) All vendors are just about the most polite people you have ever met. And there’s a rule that vendors are only allowed to sell to the section on their right — so even if you’re sitting next to a vendor on the end of an aisle to her left, she can’t serve you unless she runs up her aisle and down another aisle to put you on her right. I’m sure there’s a good reason for this, but man, if this policy were implemented at Fenway, there’d be a revolution in the bleachers before the end of the top of the 1st inning. It’s interesting to note that, although alcohol (of all kinds) is so readily available and freely imbibed at the Tokyo Dome, there is not a shred of drunken behavior in the stadium. 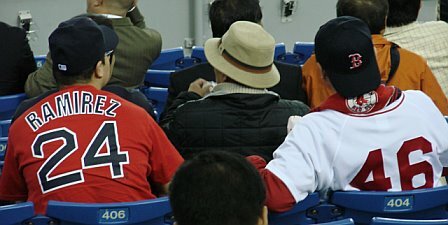 Can you imagine attending a game at Fenway Park and not seeing anyone who has had too much to drink? Being at Tokyo Dome last night made me realize just how accustomed we have become to the “bar atmosphere” at Fenway (and they don’t even sell beer in the aisles there). 7. 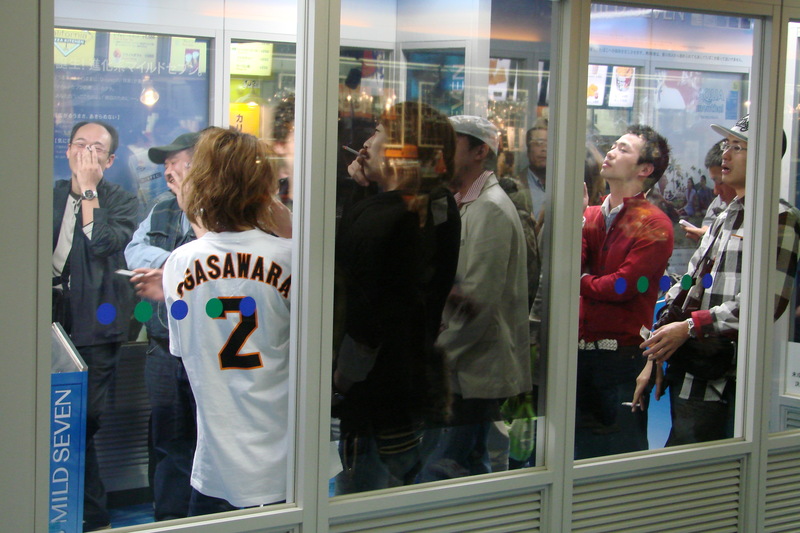 Under the stadium seats on the concourse, there are three small, glass “smoking rooms” that are jammed with fans staring up at the large flat screen TV through a thick, white fog. When the door opens and a fan enters or leaves, huge clouds billow through the doorway. 8. In the later innings, the Giants sent a pinch-hitter to the plate, and clearly it was his big day, because the fans broke out singing “Happy Birthday” to the player as he stood in the batter’s box. It’s clearly a tradition here to help players celebrate their birthday. “Friendly Fenway” isn’t quite there yet. 9. 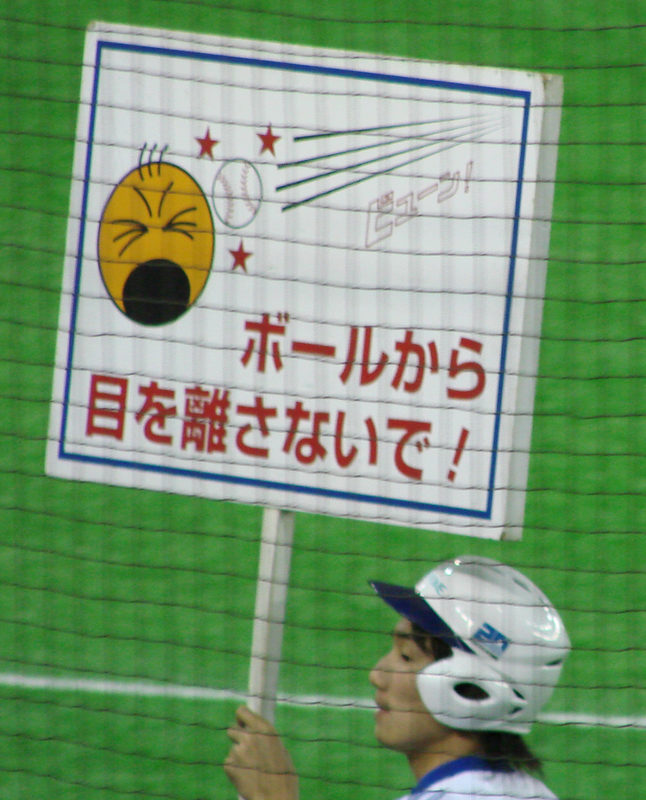 Generally, the Tokyo Dome uses the same cheering tunes we do in the U.S. (If I could hum them to you in this blog, you’d know them all.) But the voice that said “Charge!” at the end of that familiar trumpet blast could not have been mellower. And these fans get into “Y.M.C.A.” with the best of U.S. fans. 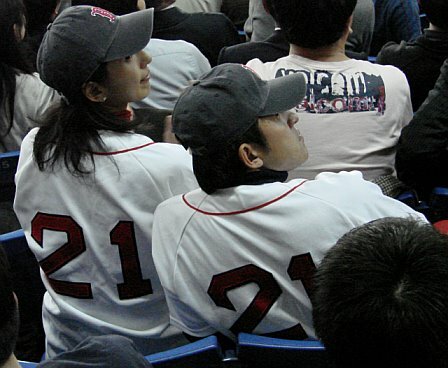 When the popular song was blared in between innings, Japanese fans were standing, contorting their bodies into the letters as the song went along. The Japanese version of the song (which is not sung by the Village People) has them yelling, “Gimme a Y, gimme an M, gimme a C, gimme an A!” Is it not truly incredible that this song has infiltrated the culture of the world so thoroughly?? 10. 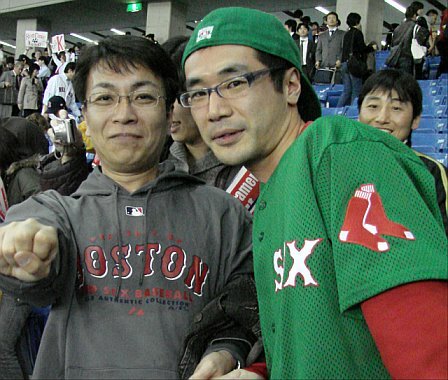 Speaking of music, we were treated to “Sweet Caroline” in the 8th inning, and “Dirty Water” coursed through the stadium after the Sox had won (do you think The Standells received some royalties in yen last night?). I have to say, while I was impressed to see so many Sox fans singing Sweet Caroline at the top of their lungs, the song was definitely not as much fun for me to sing away from Fenway and without my kids being there with me. In fact, I think we might want to create a rule in Red Sox Nation against singing the song in large groups outside Fenway Park. It’s really not even close to being the same experience away from home (and away from my children, too). 11. 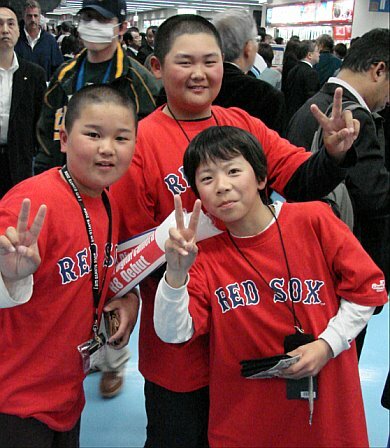 Like at Fenway, there were a lot of kids in the Tokyo Dome, and also like at Fenway, many of them were wearing Red Sox t-shirts. 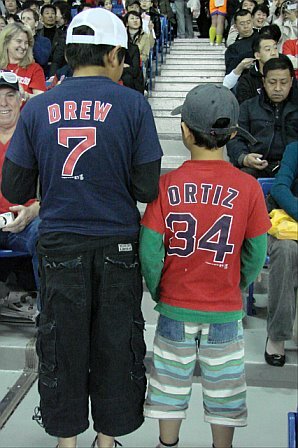 Of course, 75% of them were Matsuzaka and Okajima shirts, but I saw several Japanese kids around 10-12 years old wearing Ramirez and Ortiz shirts. Curiously, I don’t think I saw a single little girl at the game, except for the beer vendors. I missed the bus that brought us back to the hotel because I stayed at the Tokyo Dome a bit longer than others did to take a few more photos. So I took a cab (which, like all other cabs in Japan, was immaculate on the outside and inside) and arrived back here around 11:30pm Tokyo time. Walking to the elevators in an oddly quiet and deserted lobby, I suddenly noticed three men sitting at a small table, talking casually. There was David Ortiz wearing a black leather jacket and dark sunglasses. We made eye contact. I instinctively offered a “hello” gesture. He waved back. He’s seen me in the lobby twice now. We’re pals. 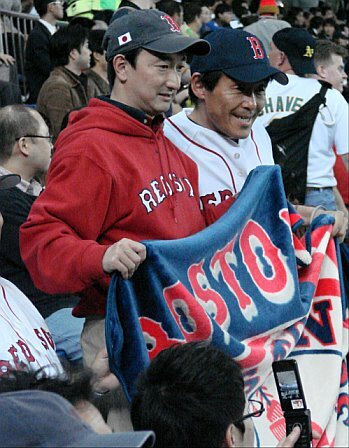 This is the first blog post in a series of posts I’ll be writing during my trip to Japan in my role as Vice President of Red Sox Nation. Our JAL 747, loaded with excited Red Sox fans from across the U.S., took off from Logan Airport at 7:30am on Saturday morning and headed northwest. Destination: Tokyo, Japan. But the trip to MLB’s Opening Day had a scheduled pit stop at the very edge of North America in the shadow of the continent’s highest peak, Mount McKinley (which can be seen on the horizon in this photo). 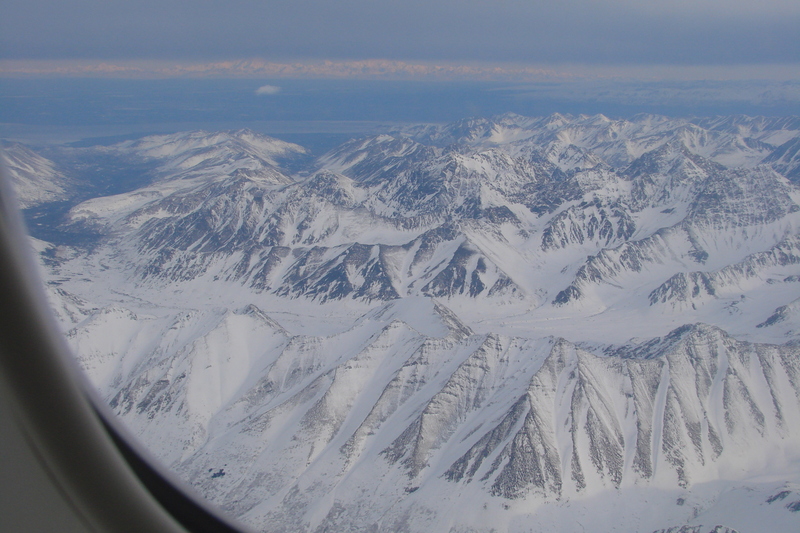 After soaring over some of the planet’s most spectacular scenery during our approach into Anchorage International Airport, we touched down at 10:15am local time and de-planed while the plane was refueled. 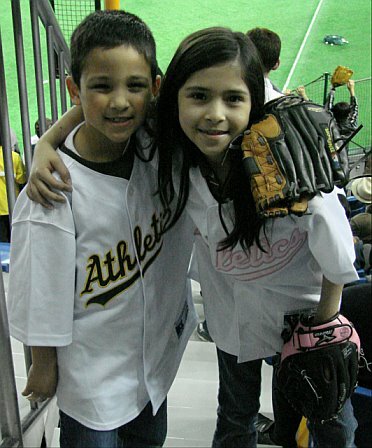 Then, it was time to play some baseball. At first, no one took my offer of playing catch seriously. I mean, who packs two Rawlings baseball gloves and a ball in their carry-on luggage for a 16-hour flight to the Far East? 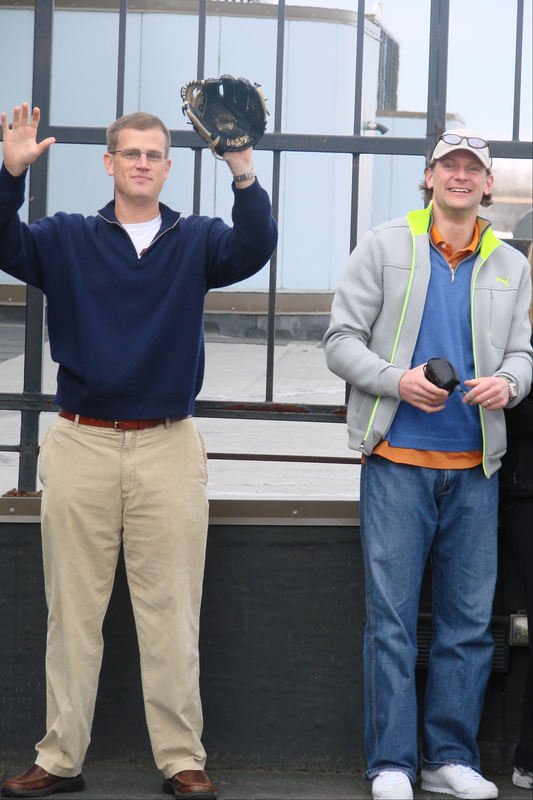 (Those of you out there who are either related to me, or know me from high school or college, know “Rob does.”) Before long, we had a crowd of people taking turns playing catch on the airport’s observation deck (which was, curiously, shaped exactly like a bullpen). 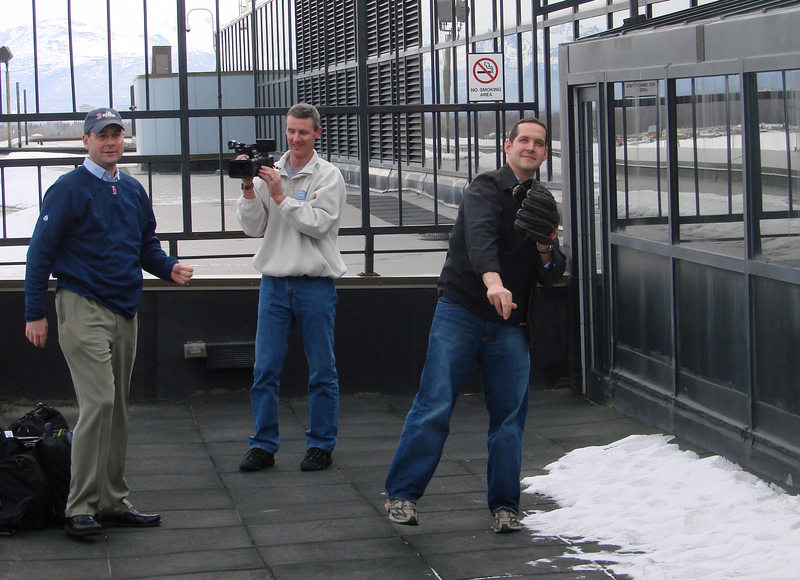 And I gotta tell you, it was truly a rush to throw around a baseball in the 27-degree Alaska air at the foot of one of the most breathtaking mountain ranges any of us has ever seen. “This is the first time the Red Sox have had Spring Training in Alaska!” quipped Red Sox COO Mike Dee, who threw some pretty nasty curveballs in his first baseball workout of the spring. 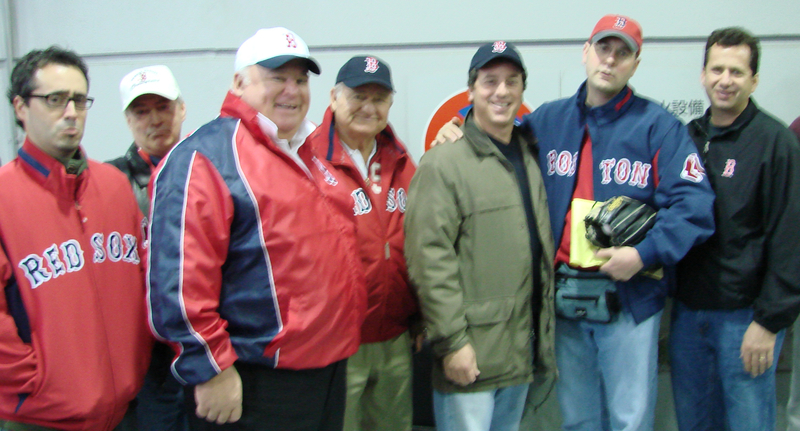 Other front office folks took turns, including Chuck Steedman, Joe Januszewski, and Sam Kennedy, as did several members of Red Sox Nation, such as Dave Ross and Kevin Kempskie, both of whom work for EMC. I’m happy to report that all participants made accurate throws and skillful catches – despite the imposing distraction of Mount McKinley looming off to the north. “When will I ever play another game of catch in Alaska?” reflected Steedman. Answer: never again. 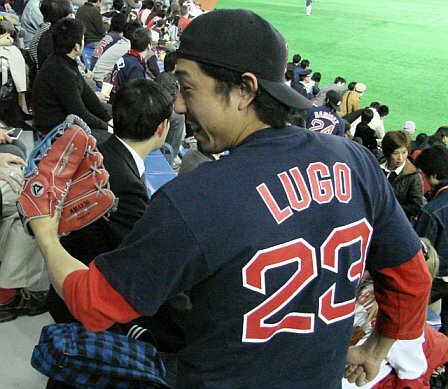 Is this the beginning of a string of once-in-a-lifetime experiences for the gang of Red Sox fans making the long trip to Opening Day in Japan? Answer: stay tuned. Doug Mirabelli had the best timing of any backup catcher in the history of major league baseball. 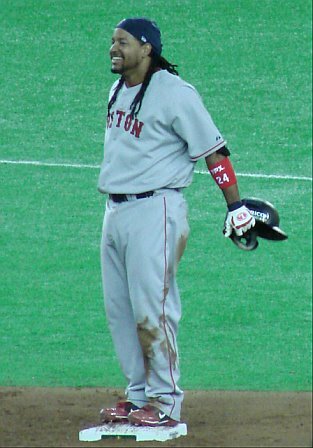 He joined the Sox in the middle of the 2001 season, as the team hurtled towards its 83rd straight year of unfulfilled hopes, then celebrated a joyfully apocalyptic championship in 2004 and another for good measure in 2007. Upon his release yesterday, he left the Red Sox as one of only eight players who played on both championship clubs. 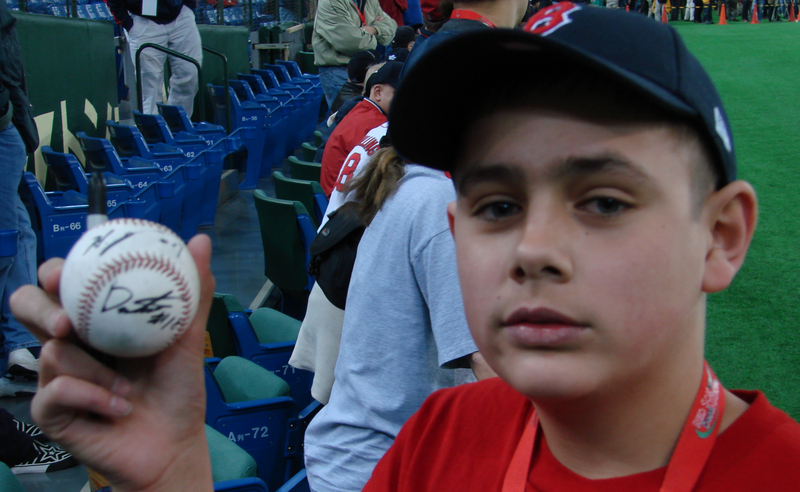 I’m a sentimental baseball fan, so I was truly saddened to hear the Sox had let Mirabelli go. But I trust Theo and Terry and I’m sure it was the right thing for the team. What never ceases to surprise me, however, is how easily fans and media let someone like Doug Mirabelli just slide out of sight. He’ll get a short article in the Herald and Globe that will be primarily about how important Varitek is to the team, and the callers to our sports talk show radio stations today will say, “Doug was overweight and slow, and he couldn’t hit a lick, good riddance!” We obsess over these players and cheer for them like crazy, then when their usefulness is spent, we discard them like old cell phones. I realize that every professional baseball player’s career must come to an end, and that they always come to an end while the player is relatively young (Doug is 37, and in the whole scheme of things, that is young). I realize that turnover in baseball is inevitable – and, ultimately, desirable. I realize that Mirabelli’s batting average dipped to .202 last season and would probably have dipped below the Mendoza Line this season. I’m not saying that releasing him was not a smart move. But let’s give the guy his due. He was the only player capable of catching Wakefield’s wicked knuckleballs. 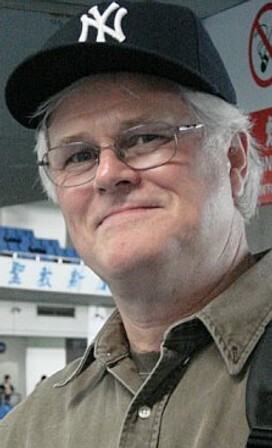 He hit some dramatic, key home runs as a member of the Red Sox. He accepted his backup role with grace and appeared to be a good teammate, too. And most importantly, he was our backup catcher during the greatest era in Boston Red Sox history since the early 20th Century. I’m like Bart. There’s a part of me that wants to believe the illusion that that 2004 team can last forever; that the Wake and Dougie battery will be there every fifth day for eternity. And that part of me died a small death yesterday with the news of Mirabelli’s release. Of course, for Doug Mirabelli himself, the news has to be its own unique form of dying. It’s the end of the most magical period of his life. “Not a lot of fun for anybody,” said Terry Francona about breaking the news to Mirabelli prior to yesterday’s game.